In November of 2012 and January of 2014, Board Member, John Oliphant, PhD travelled to Liberia with what is now one of OWO’s partners, EarthSource Minerals, Int’l, to do an assessment of the status of healthcare and medical education in the country. He was able to meet with leaders from the Ministry of Health, Liberian Medical and Dental Council (LMDC), as well as the leader of most of the country’s medical training programs. Dr. Oliphant also connected with the Liberia National Physician Assistant Association (LINPAA) and was granted a license to practice medicine in Liberia as a PA. He has continued to enjoy an ongoing working relationship and friendship with the leaders of LINPAA, LMDC, The Tubman National Institute of Medical Arts PA program (which may actually be the first PA program in the world) and various other medical and higher education leaders. When Ebola hit Liberia and West Africa, Dr. Oliphant called a meeting at his home of the OWO Board and like-minded friends to discuss how we might get involved with the solution. He was deeply moved by his knowledge of the challenging conditions faced by the dedicated Healthcare Providers in Liberia who often were forced to see patients without adequate Personal Protective Equipment (PPE). Working with many different partners, OWO was able to send and distribute 3,000 pounds of PPE and other medical supplies in our first initiative, the PPE Initiative. 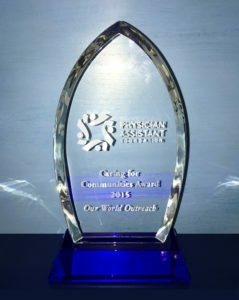 When the Physician Assistant Foundation found out about OWO’s efforts in Liberia, they awarded OWO their prestigious Caring for Communities Award. This initiative was also supported by Chevron and many other individuals and groups. 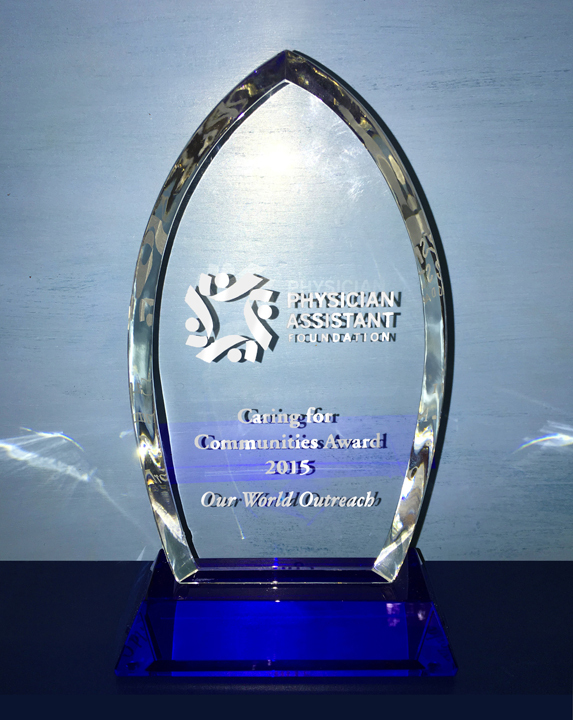 In May of 2015, Dr. Backus and Dr. Oliphant travelled to San Francisco to receive the Award at the American Academy of Physician Assistants & PA Foundation’s Paramount Awards Banquet. Dr. Oliphant delivered the keynote address. Check out the full story on the PA Foundation Website.